Website created for an online newspaper making use of the ideology of Web 2.0 and a combination of the latest available technology, this website is designed and developed to make it look and function like a regular online newspaper. 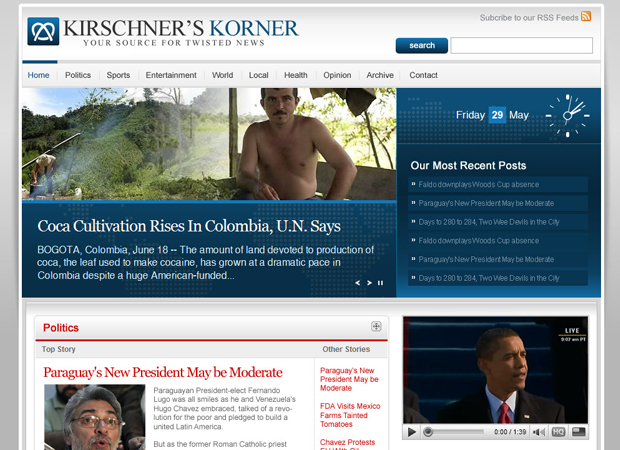 Kirschners Korner was created with the idea of an alternative point of view for news and stories in a satirical way. Our challenge in this project was the creation of a site robust enough to handle a lot of information and easy-to-use for the end user to dive into it. The website design part was created with the idea of an online newspaper, clean and easy to browse. The real challenge was in the web development part of the project; allow huge quantity of information to be loaded in a smooth and fast way was the main requirement. The Back-end administration platform was creating following the same ideology, flexibility, user-friendly and strength.